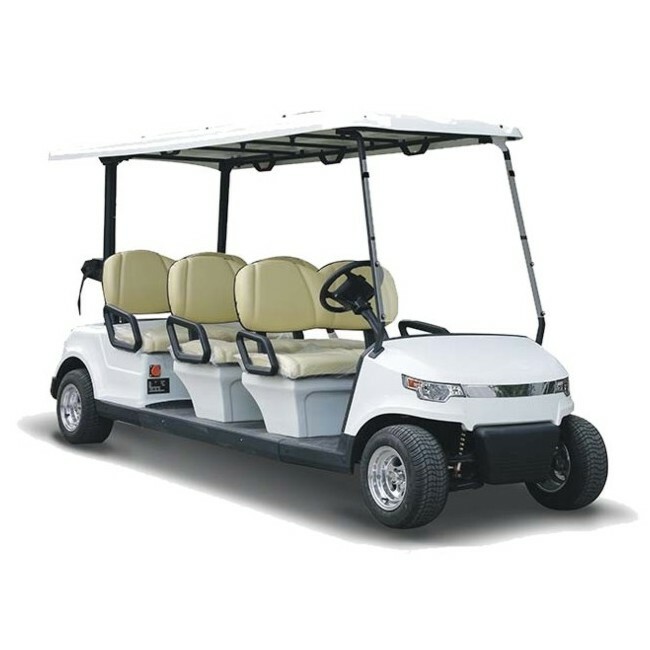 Powerhouse Golf Electric Hospitality vehicles provide your guests with a luxury experience they deserve when being transported around any function or gathering. Keeping all of your guests together whilst transferring from one location to another makes for a friendly atmosphere and keeping the experience a pleasurable one. Designed for comfort with style and reliability as standard, the Powerhouse Golf Hex range offers a no-nonsense solution to the transportation requirements for many years to come. As a golf buggy owner, specialist insurance is an important consideration. Many golf clubs will insist you have personal liability cover in force whilst using your golf buggy on the course whilst playing or practising golf. Golfplan International Golf Insurance is available for this buggy. Click here for more information. This buggy is fitted with 6 x Trojan deep cycle deep discharge batteries for performance and reliability for years to come. Including simple on-board "Quick connect" fitting. *Note: Life expectancy will be effected by Frequency of use, type of charger, payload and terrain. We offer full delivery options, see link information below. Please select the appropriate delivery option at checkout depending on your location. If telephone advice fails, Damaged component or complete buggy must be returned to base (Ideas Solutions Ltd), so that an examination can take place. All returns must be accompanied by a "Returns Note", (downloadable from our site). Components must be returned to base prior to a replacement being sent. This is a return to base guarantee. If any parts should become defective during normal use, will at the Company's Sole discretion be repaired or replaced free of charge. Transportation charges on parts submitted for repair or replacement must be bourn by the purchaser. The end user will be responsible to remove defective part, and refit replacement part. a. The guarantee does not cover defects arising from wear and tear, accidental damage, misuse or neglect, tampering by unqualified persons. Also abnormal wear and tear caused by hire or commercial usage are excluded from this guarantee. b. All liability in respect of any third party and consequential loss or damage, however arising, is expressly excluded. c. This guarantee will be invalid if any alteration, modification or substitution of any parts other than specified is made or if the equipment is connected to an electric supply other than which it is rated or adjusted. e. This Guarantee is not transferable and applies only in the United Kingdom. f. We reserve the right to ask for Proof of failure by means of report from authorized dealer if batteries are not returned for inspection. THIS GUARANTEE IS IN ADDITION TO THE CONSUMER STATUTORY RIGHTS AND DOES NOT AFFECT THOSE RIGHTS IN ANY WAY. We also offer a variety of trailers and ramps designed for the purpose of transporting your buggy with ease.